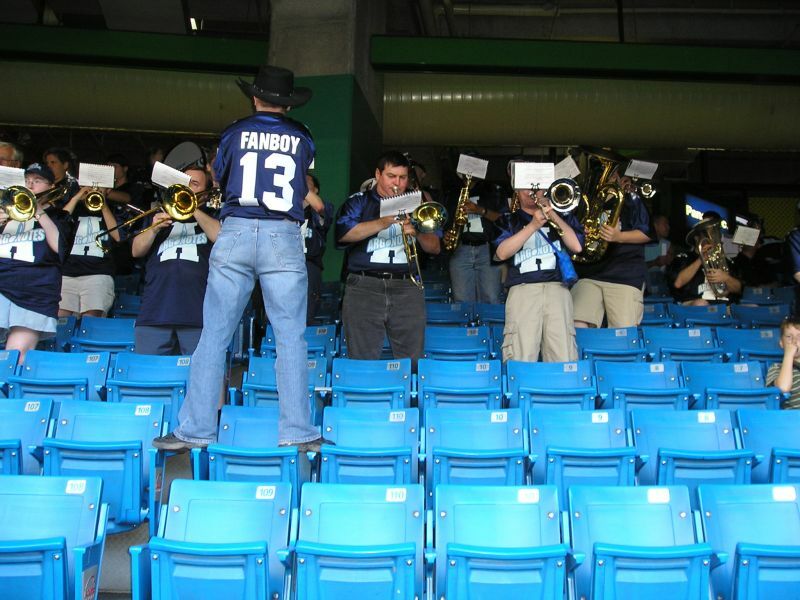 What's Next: Watching from the stands sans instruments with all the other CFL fans. ! 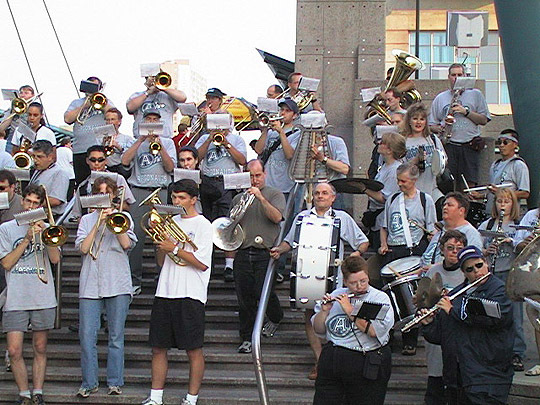 Join the Band! 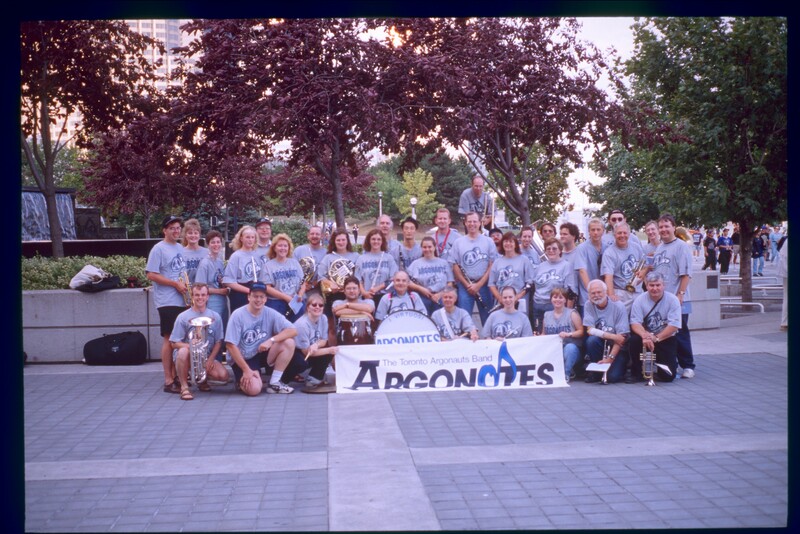 Thanks to some of the camera and scanner-happy members of the band, we're pleased to present you with this selection of photos of Argonotes In Action starting with the 1995 and through to last season. 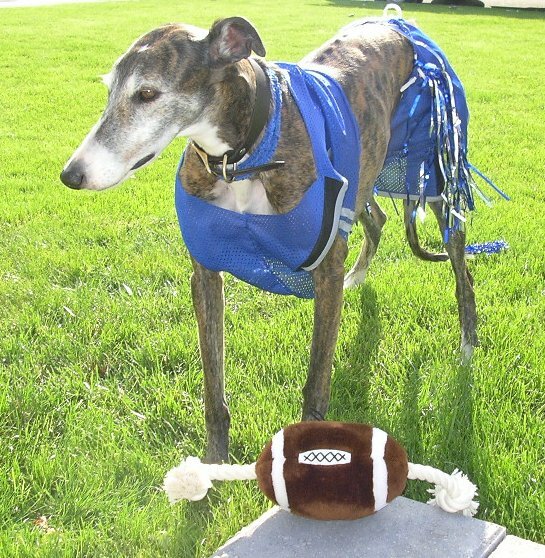 Still too young to join but he's ready to play. Debating which of the marvy Steelback beer brands we should sample next. 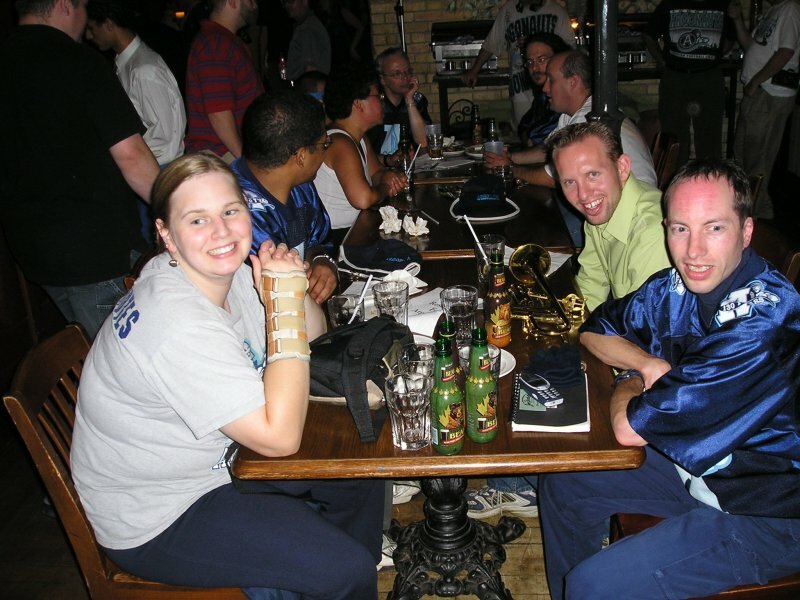 Another team successfully vanquished time to relax and unwind at Badali's. Ready to go but we seem to have misplaced our Conductor, have you seen him? 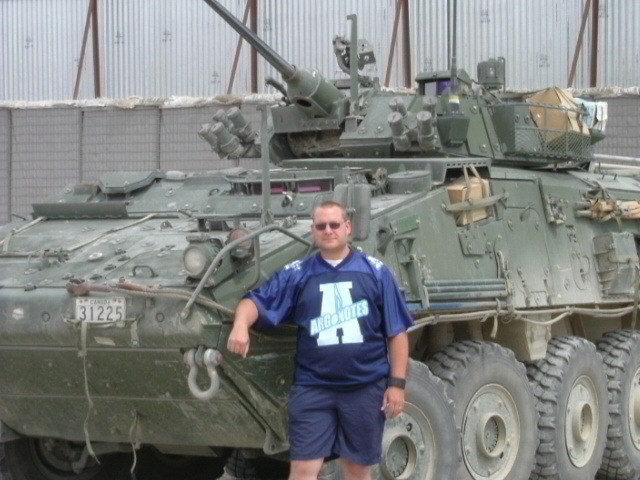 Argonotes are everywhere, and in Afghanistan no one complains about his playing. The band from a whole new perspective, the top of the CN Tower. Photo byMattias. 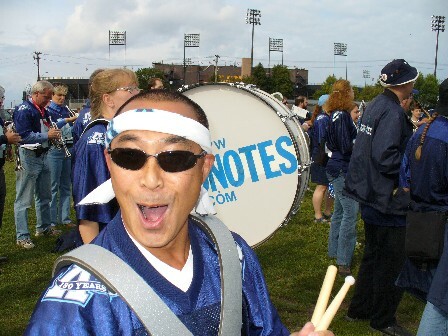 Our Dictator models our new jerseys. 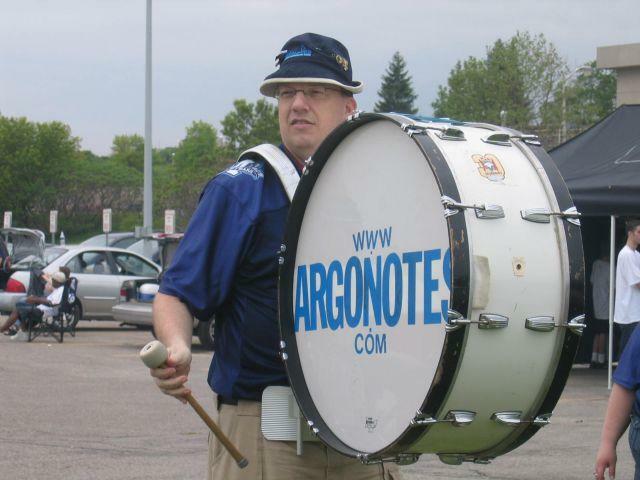 The Argonotes go to sea with the Cheerleaders. More Boat Cruise PicturesPhotos by Luana Martins, Heather Keith, Steve Hayman. Warming up at our staging area outside Joe Badali's on Front Street. 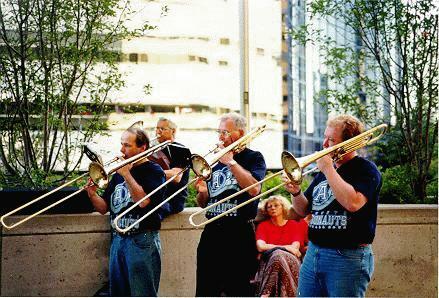 An impromptu concert for our friends at the Steam Whistle Brewery. Photo by Heather Keith. 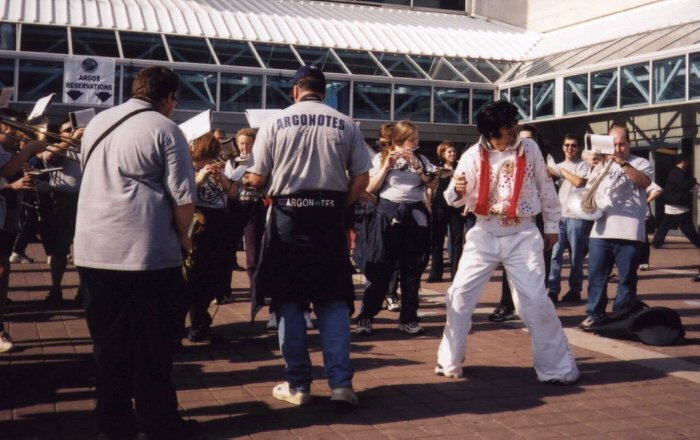 It's a good thing we have Heartbreak Hotel and Hound Dog in the book; you never know who's going to drop by.Photo by Heather Keith. 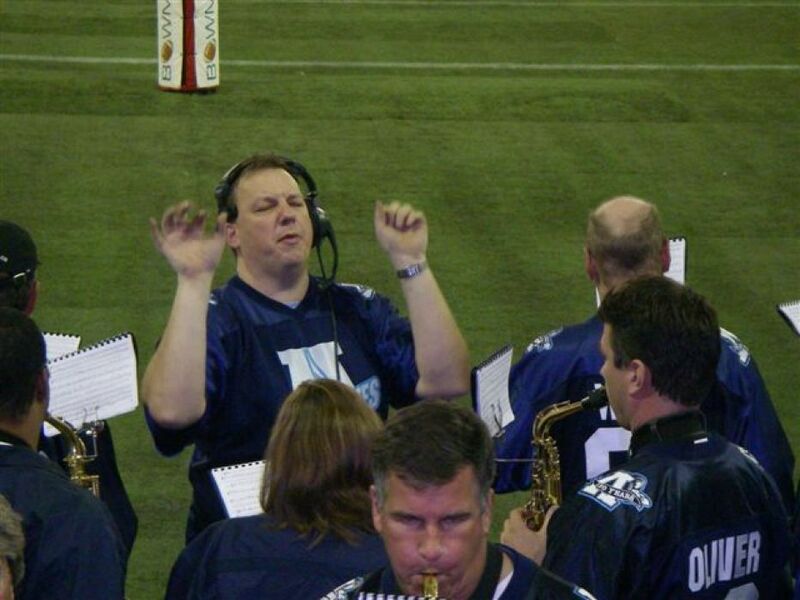 Somebody in the band sees the camera! 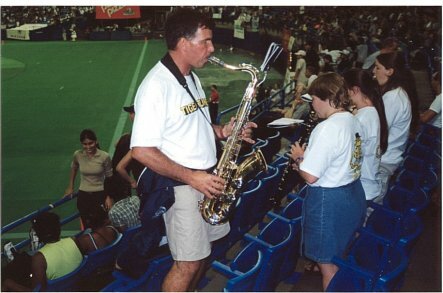 Somebody else in the band is eating a pretzel! Photo by Heather Keith. 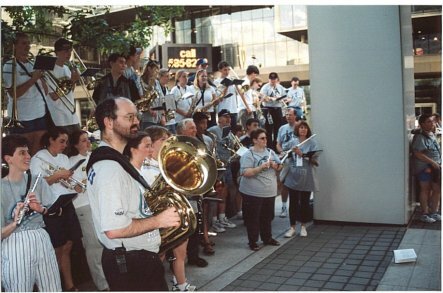 Playing outside Gate 2 before the big game against Hamilton on July 28, 2000. 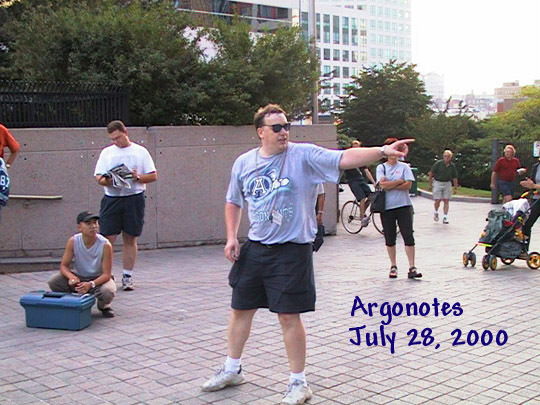 (Yes, we need to get a few more Argonotes shirts.) Photo by Darryl McGleish. Steve spots his Aunt Lenore and Uncle Donald in the crowd. Photo by Darryl McGleish. It was hot that day. No, really, it was hot. And humid. 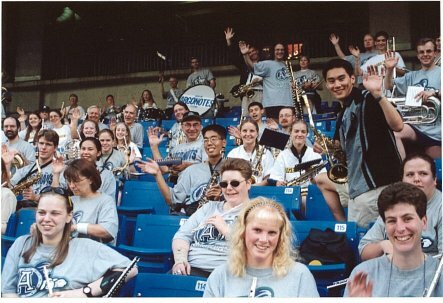 (And that's Aunt Lenore hiding in the front row of the band, wearing the Ticat hat.) 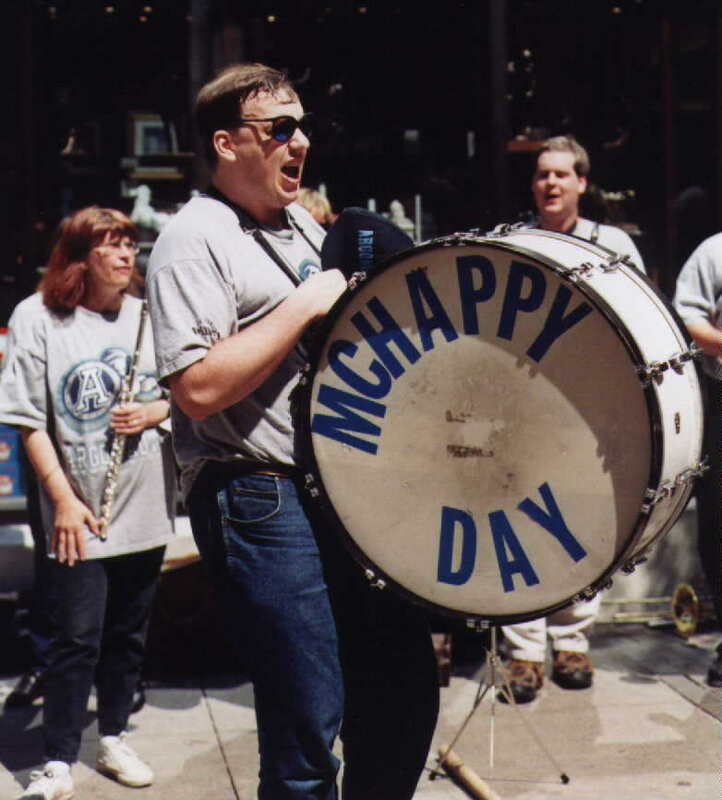 Photo by Darryl McGleish. 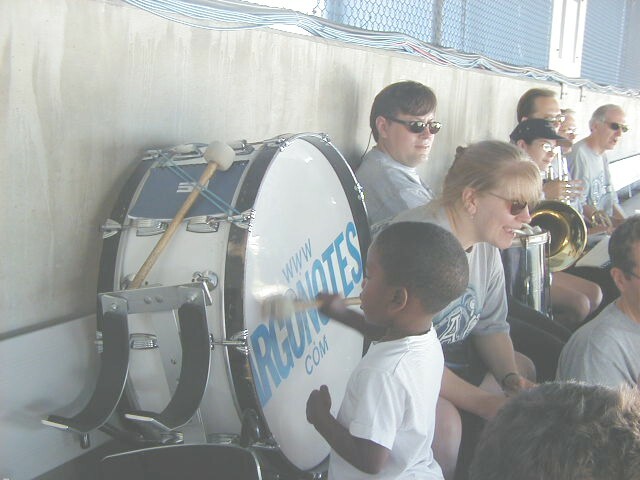 Sarah, Sidney and Tamsen Hutchison enjoy the band's pregame show with their mother Jennifer (the Ticat-in-the-Hat), while their Uncle John plays french horn with the band. 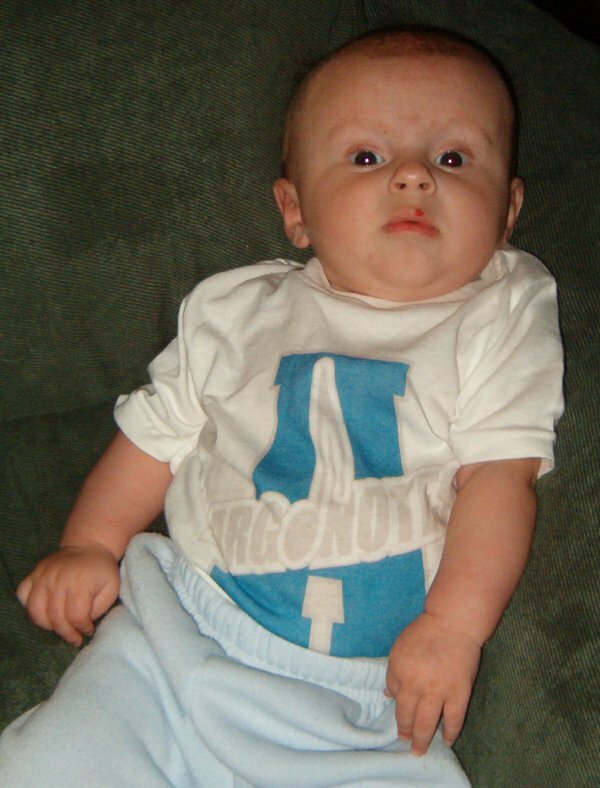 Photo by Uncle Darryl McGleish. Or possibly Aunt Carol. 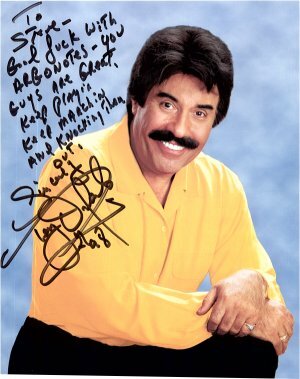 Special greetings to the band from our Patron Saint, Mr. Tony Orlando. 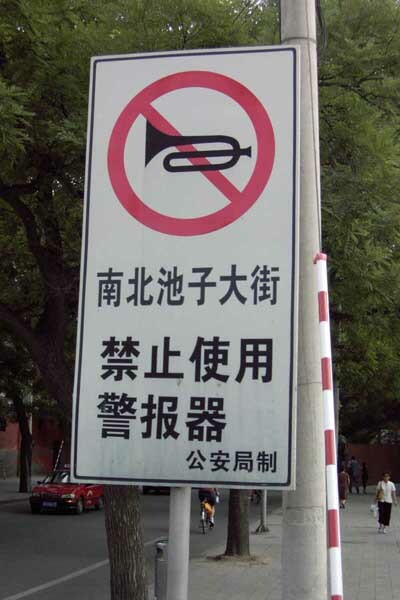 Musical dictator Steve Hayman prepares to give the usual small, subtle cue to the trombone section at bar 32 of Mony Mony. 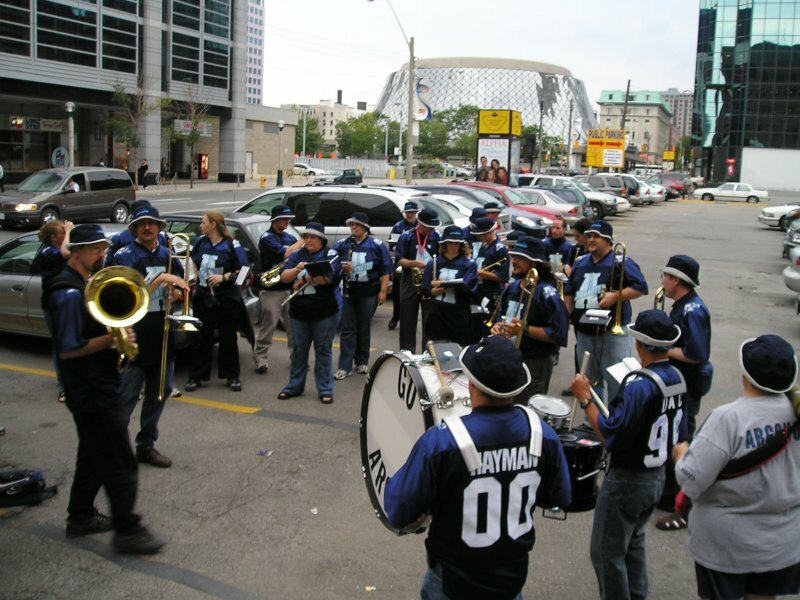 Just before our big appearance on the CBC 6:00 News Weather Report - which host Bill Lawrence conveniently does from outside the CBC building, conveniently on our pre-game route to the Skydome. 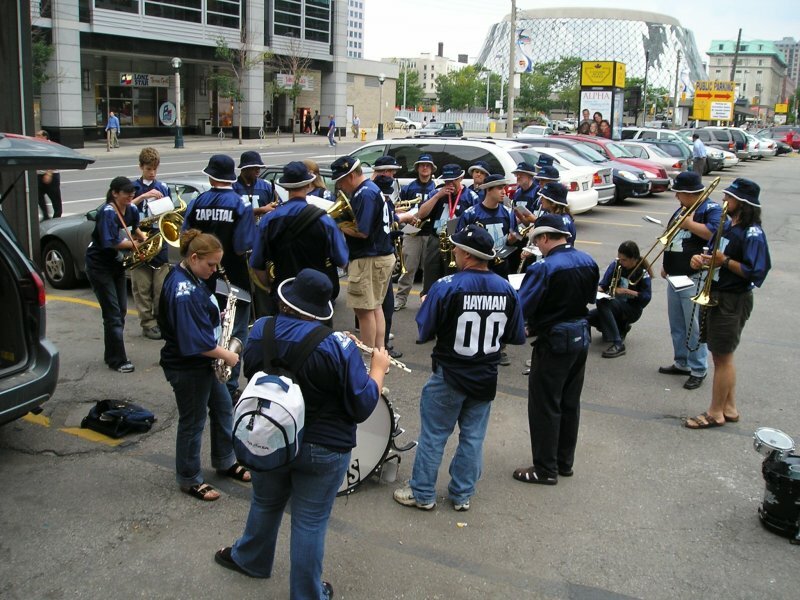 One big honkin' band, stretching as far as the eye can see., performing the sax feature Heartbreak Hotel outside the dome before the game. Everybody wave! 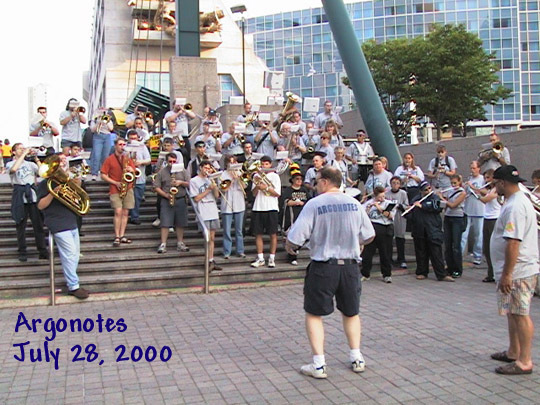 A big turnout for the Toronto/Hamilton game on June 25 1999. 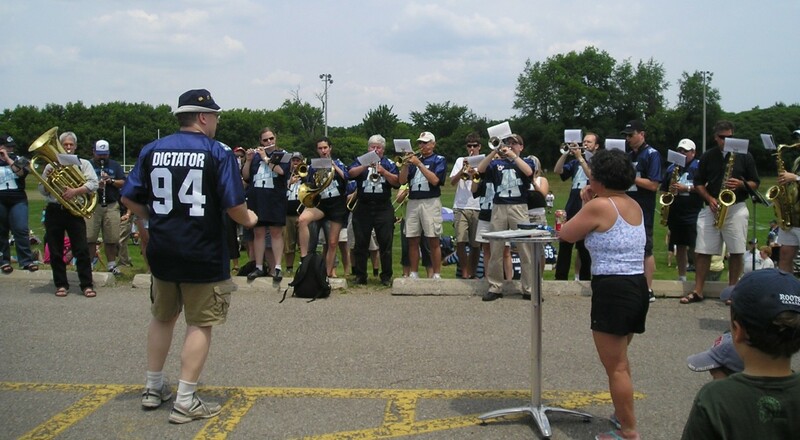 Guest conductor Steve David, founder of the Uxbridge S.S. Tiger Tunes, brought his band to join us and we even let him stand at the front. 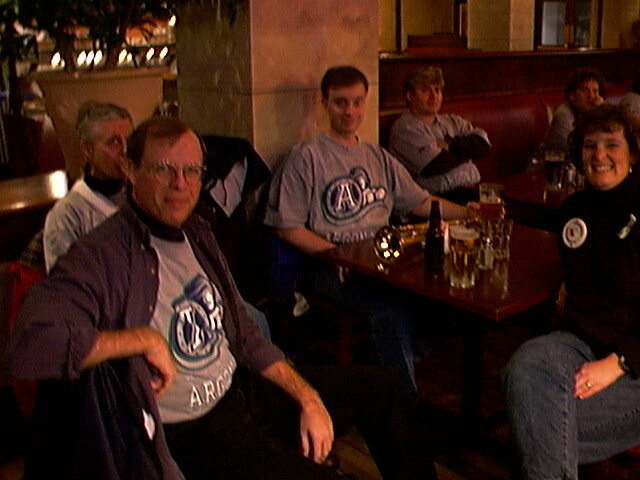 Below are some shots from our first ever overnight trip, November 7-8 1998 to the Argos/Alouettes playoff game in Montreal. 31 of us made the trek down on the train. 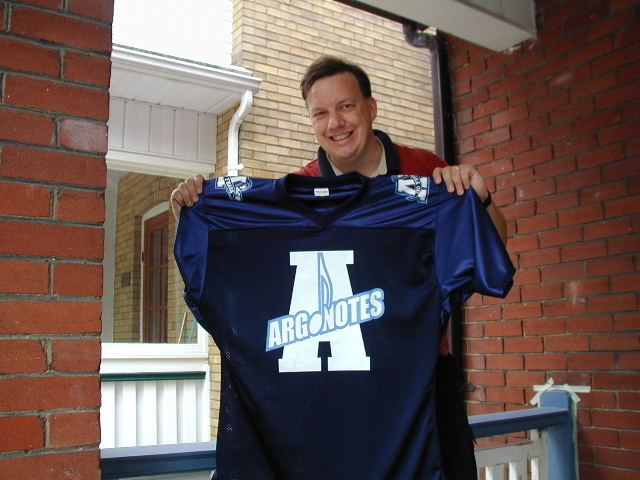 Alas, the glorious Argos fell to the Alouettes, but we had a terrific time at the game, fuelled mostly by the additive-laced Molson Stadium coffee. 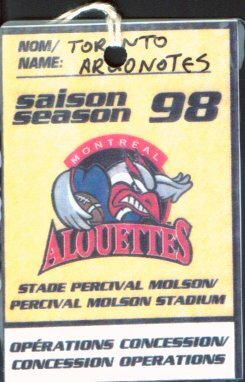 This is, without a doubt, definitely the nicest laminated game-day pass we have ever received for a playoff game in Montreal. 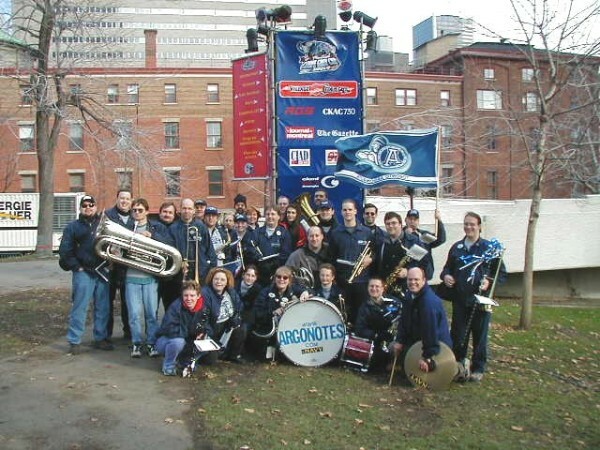 Our pre and post-game shows at the corner of University and des Pins. 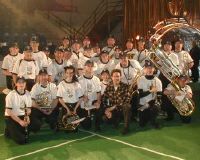 Elvis Stojko walked right past the band shortly after this photo was taken by Heather Keith. 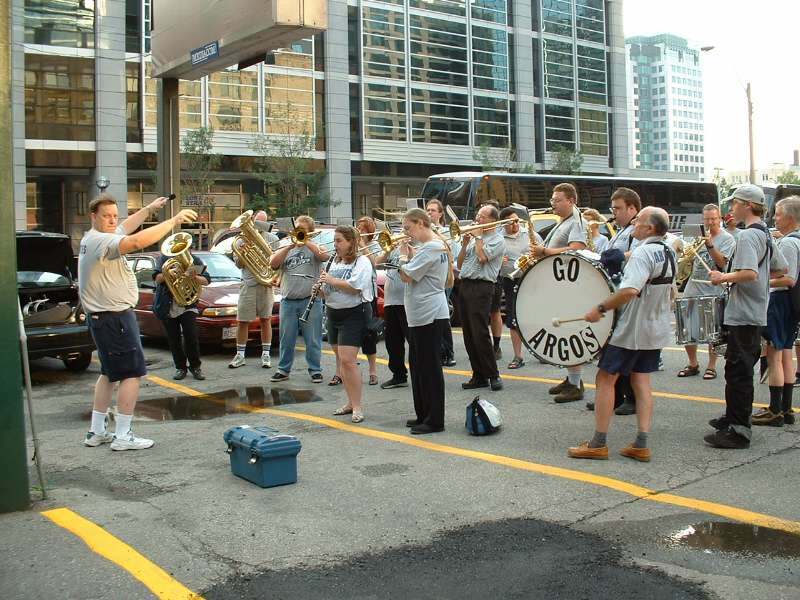 Marching - and we use that term very loosely - up Bay Street in the 1997 Argos Victory Parade. Photo by Ron "Argonut" Philipp. 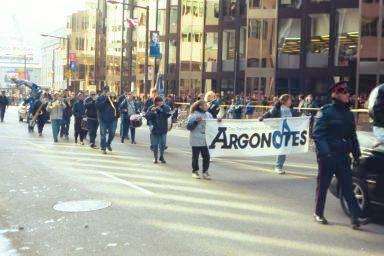 You can see more Victory Parade photos on Argonut's Fan Page. 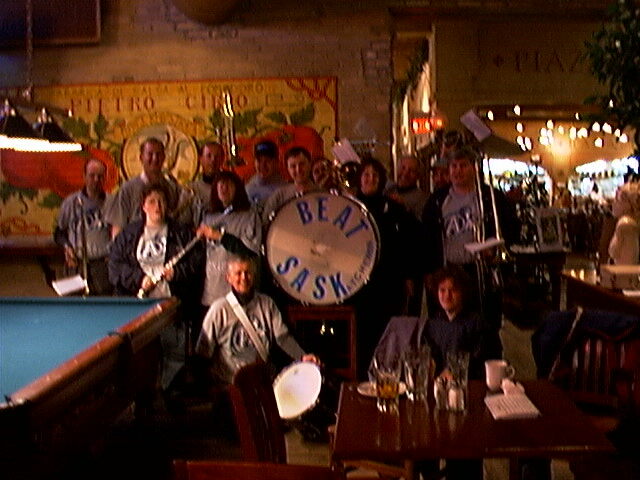 Celebrating the Grey Cup 1997 Victory at Joe Badali's Restaurant. 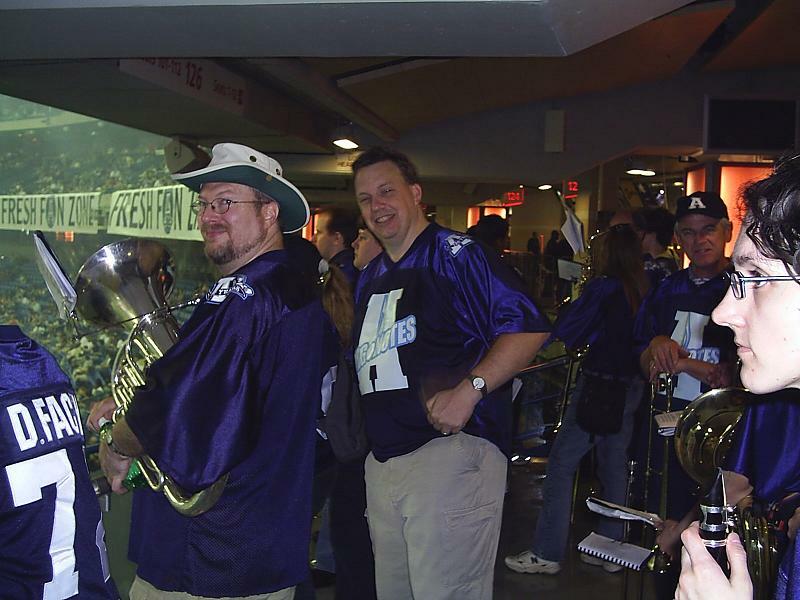 Bud Tangeny (Snare), John Empey (Clarinet), Gord Payne (Trumpet), James Brown (Trumpet), Trevor Mangion (Trumpet) and Julie Clubb (Flute), all very hard at work cheering on the Argos in Grey Cup 1997. 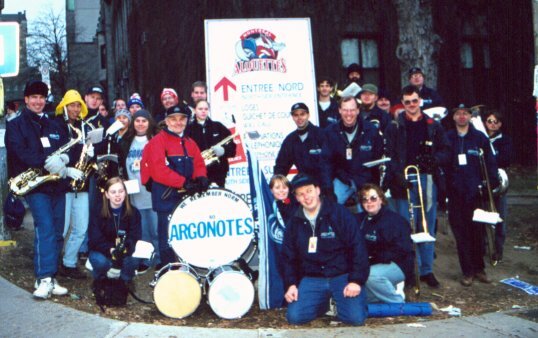 On board the Good Ship Argonaut (with the Argo cheerleaders) during the 1996 Grey Cup Parade in Hamilton, as seen live by millions on CBC. 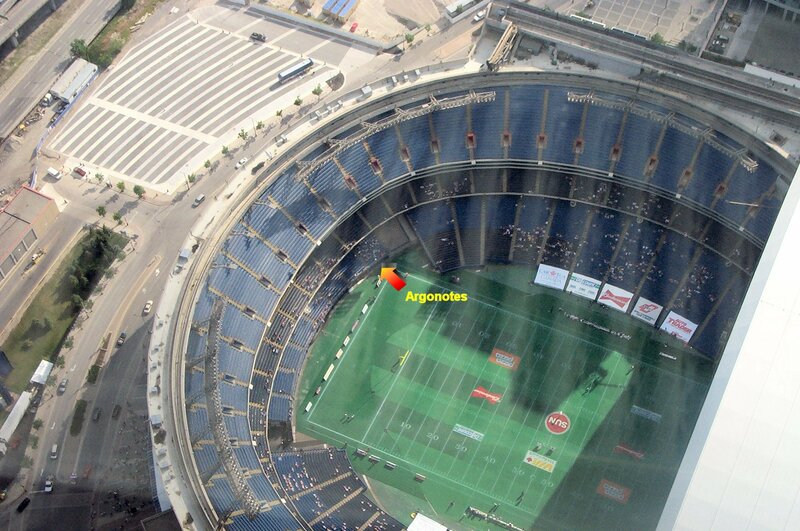 An overhead shot during the Grey Cup Parade. 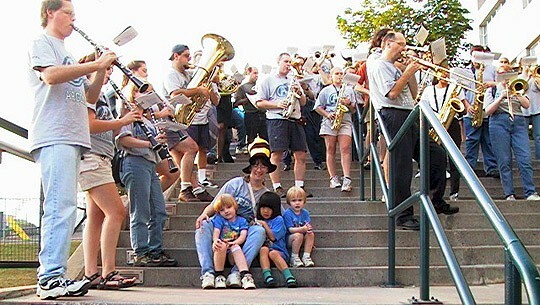 Note the throngs of booing spectators that welcomed us warmly for the entire three miles of the parade. 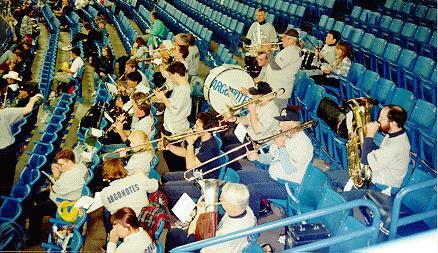 Gord Payne - arm barely visible at left, but trust us, it's Gord - directs the band in the stands during the October 5 1996 defeat of Winnipeg. 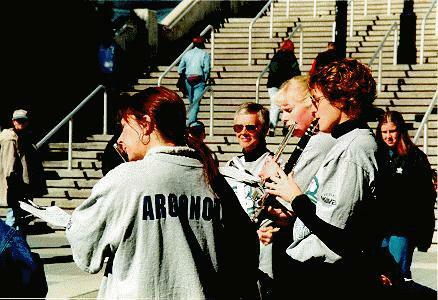 Gillian Meecham (flute), Bud Tangeny (snare), Janette Pluister (flute) and Caroline Boone (clarinet) at our pre-game gig outside Gate 5, October 5, 1996. 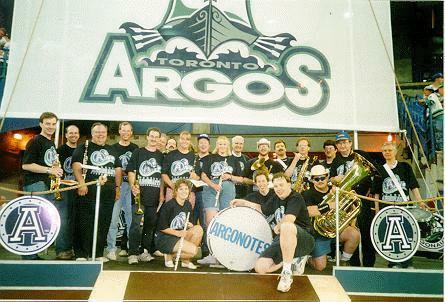 Here we are in our official 1995 team photo on October 27 at the end of our inaugural season, having just cheered Toronto on to a defeat of Calgary on Canadian Unity Day at the Skydome. This photo turned out great. 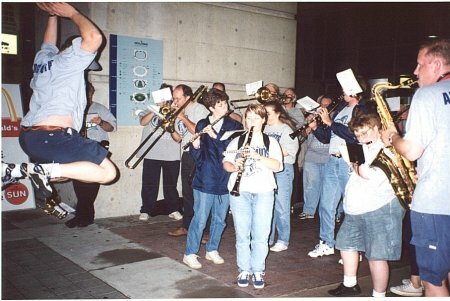 Ever since then, we haven't been able to snag a decent group photo of the band for some reason. 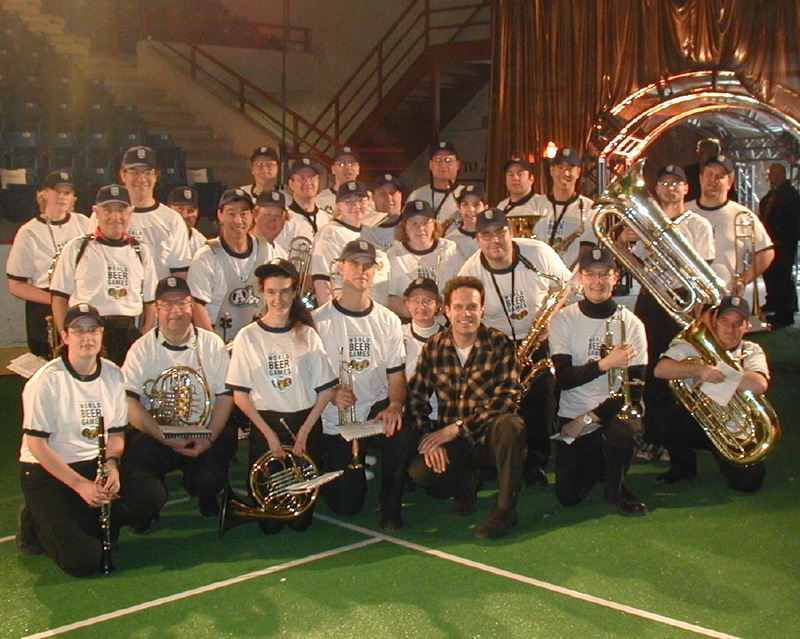 This shot was taken after our first game ever, Toronto vs Saskatchewan on June 24, 1995. 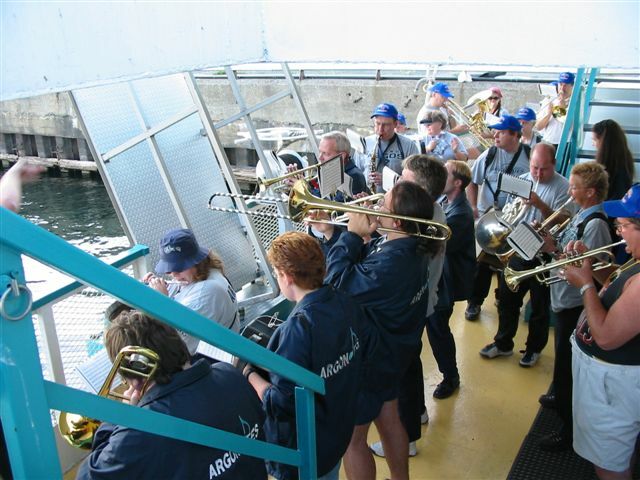 For the first few games of that season, we'd gather on this Argonaut Ship - technically a trireme (thanks Doug) that had been erected at one end of the field - prompting calls of A Band On Ship! 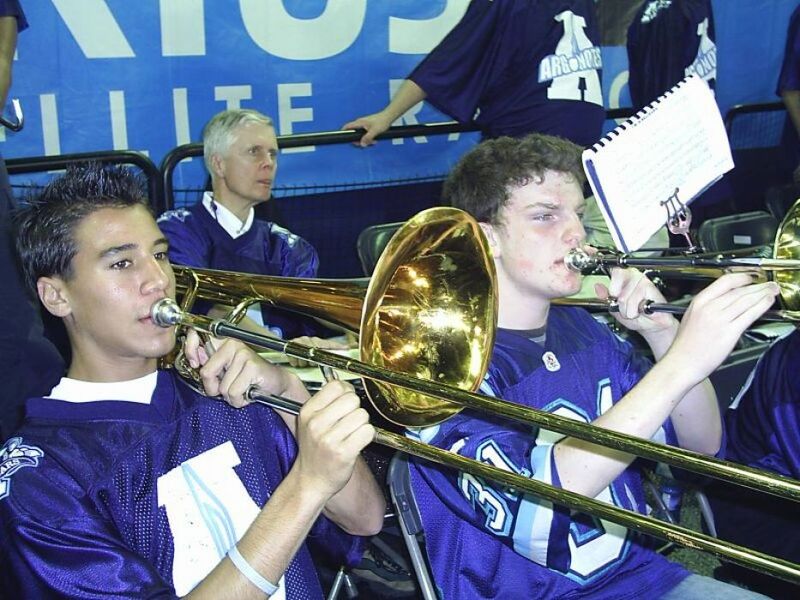 whenever it was time to play a tune. 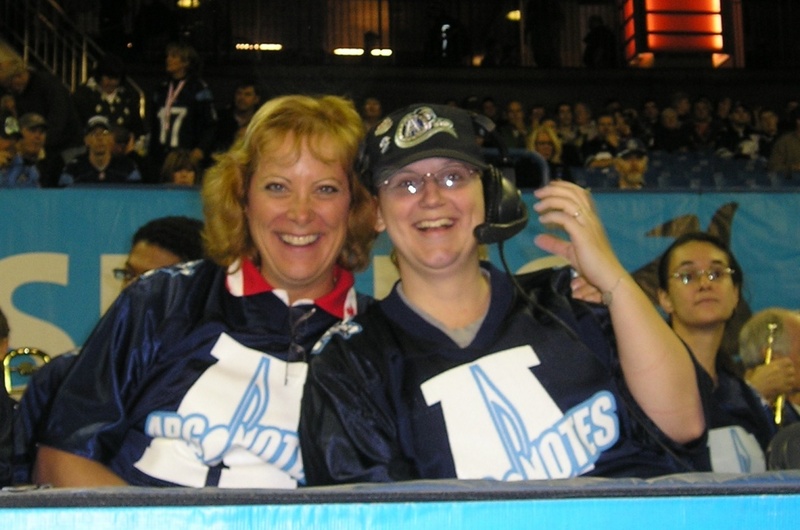 This ship gave us a great view of the field but it was too good to last, and partway through the season it became the Q107 Party Vessel, on which contest winners (alas, not including the band) were served food and drinks during the game. 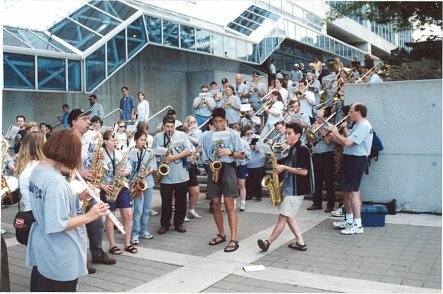 "UW grads Gord Payne, BES '89, Steve Morris, BMath '93, Andrew Darbyshire, BES '88 and David Keith, BMath '90, serenade Argonauts fans outside Skydome, while Angela Chambers, BMath '91, wields the cymbals. " 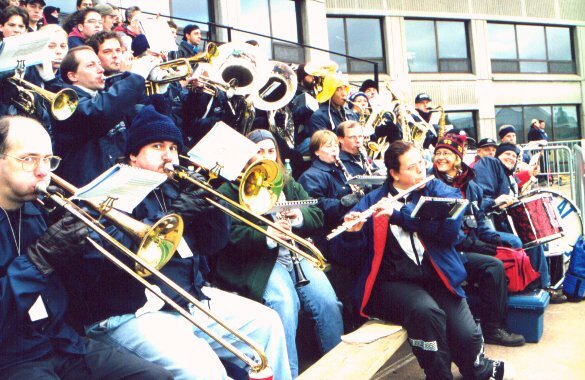 From the article about the Band in the UW Alumni Review.